Ermitage students are asked to think critically about their impact on an ever-changing world. Encouraged to challenge the world they live in, students engage more intensely the issues facing their peers and their environment. Students participate in a variety of service-learning opportunities throughout the year, such as ICU2 India, which is an Ermitage project to provide eye care to underprivileged villagers in India. 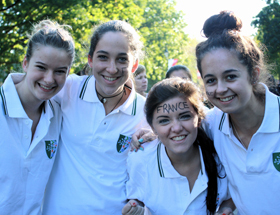 Round Square also offers "RSIS" projects, which Ermitage students can participate in with peers from other schools around the world. Ermitage has developed ICU2 in conjunction with Round Square partners, and has been successfully hosting the eye camps throughout India for the past 10 years. ICU2 is committed to contributing to greater intercultural understanding between the peoples of this world through international service learning projects. ICU2 strives to provide children and adults with a screening exam, prescription eye glasses, or further eye care when necessary. It does this with the help of secondary students in partner schools, local partners, including schools of optometry, eye hospitals, opticians, and community support. The trip is an exceptional opportunity for students to explore rich culture, face challenging conditions, and quickly build an international team. Hosted in Indore, India with the help of Daly College, the students connect with their peers to explore local villages, learn to communicate across languages, lend a helping hand to the less fortunate, and adjust to other differences, such as with the climate, when traveling so far from home. In February 2012, the Ermitage and Daly College ICU2 team broke all previous records by assisting a whopping 6000 patients with an estimated 5200+ glasses distributed and 210 cataract operations. Ermitage students have had a great track record participating in the RSIS projects; most recently being active leaders in the Peru (RSIS Peru Project Report) and Canada projects. All students are strongly encouraged to attend as the projects truly are a once in a lifetime opportunity for international team building and increasing participants' awareness of cross-cultural understanding. RSIS Projects are offered during the months of December and July, and usually last around 3 weeks. The December projects are offered in Cambodia, India, Kenya, Honduras and Thailand. Currently, the July projects are offered in South Africa, Peru, Canada, India Ladakh. For more information about RSIS projects and how students can get involved please visit http://roundsquareprojects.org/ or email roundsquare@ermitage.fr. Ighalen School, Morocco: Ermitage students have joined partner school Ecole Elraki of Marrakesh, Morocco, in building an extension to a small village school in the Moroccan countryside. This project is particularly special as the connection to the Ecole Elaraki was initiated by IBDP students as part of their CAS project. Students were able to experience the rustic beauty of the Atlas Mountains and learn how to work hand in hand with local people and Moroccan students. Ban Mae Lid School, Thailand: The Ban Mae Lid School, located in the northern forests of Thailand, welcomed a delegation of students from a variety of Round Square schools. Organized by the Regent School, Pattaya, as part of the annual Global Round Square Conference, our students were tasked with constructing water towers for the local school. Students rotated between hands-on labor and time in the classroom teaching English as a third language to the local children. While the work was plentiful and challenging, the jungle setting, playtime with the Thai children, and the home cooked traditional meals, made for an unforgettable experience. Solidarité Logement: This community service association based in Maisons-Laffitte strives to help disadvantaged families by helping them find housing and support the rent payments during a period of two years. This allows families to focus on rebuilding their livelihoods without the burden of not having a stable home and having to pay rent. Ermitage students have had the pleasure of helping in this endeavor by cleaning and refurbishing apartments, and getting involved in a campaign raising awareness. Banque Alimentaire: In association with the Lions Club, Ermitage students have had a yearly impact on the food drive organised in the grocery stores of Maisons-Laffitte, Mesnil-le-Roi, and Sartrouville. Each year, they help collect hundreds of boxes of canned and nonperishable food items that are then distributed to food kitchens in the area. Love in a Box: This charity drive takes place during the holiday season and strives to collect shoe boxes filled with specific items, such as toys, candy, toiletries, warm clothing, etc. Each box is carefully decorated and then distributed during the holidays to children in need. Ermitage students have had a positive impact since joining this project in 2009.